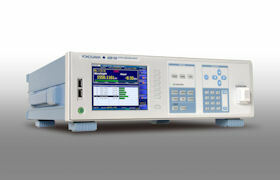 The Yokogawa AQ6150 and AQ6151 are among the fastest instruments on the market today, requiring just 0.3 seconds to measure, analyze, and transfer the result. This is more than three times faster than our previous models. The AQ6150 and AQ6151 will thus greatly improve throughput in applications such as the production of tunable optical sources where every source is subject to several hundred measurements for adjustment and inspection. The Yokogawa AQ6150 and AQ6151 can measure up to 1,024 different wavelengths at the same time. 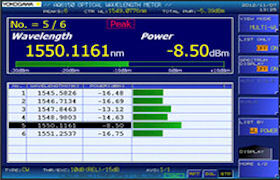 They are thus well suited for measuring the output wavelengths of dense wavelength division multiplexing (DWDM)*1 systems and are also used on laser device production lines to improve efficiency by simultaneously measuring the output of multiple devices.